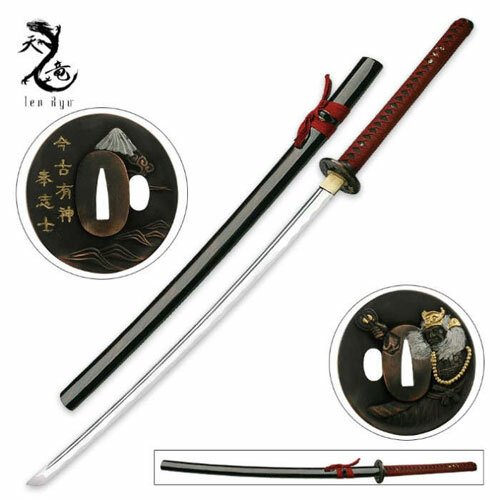 Ten Ryu Swords for sale are durable and functional full tang Samurai swords. Ten Ryu makes these handmade swords using traditional Japanese methods like hand sharpening and hand forging. The high carbon steel blades are heat treated and cooled for strength and flexibility and each blade is hand fit to the scabbard. Buy these popular Ten Ryu swords on sale now. Red Mountain Katana Swords for sale are 43.7 inches in all. These handmade samurai swords feature a mountain motif on the tsuba and a sharpened full tang katana blade. 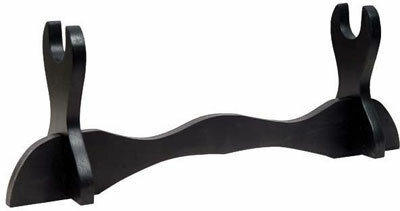 The functional 27.9 inch carbon steel blade is 7.5 mm thick and features a traditional blood groove. The handle features a traditional maroon cotton wrap over real ray skin. The blackened iron tsuba features a mountain motif with silver and gold metal accents. The reverse side of the tsuba depicts a fierce samurai warrior. The shiny polished black lacquer scabbard is accented with maroon cotton. These swords include a black cotton sword bag. Buy the Red Mountain Katana Swords for $99.99. Tabletop Sword Display Stands for sale provide a great way to display your swords. These display stands are manufactured of wooden construction. They have a black finish which allows them to match all kinds and colors of swords. These stands measure approximately 11 5/16th inches by 4 5/16th inches. A popular way to display your swords on a flat surface or desk, buy these Tabletop Sword Display Stands for only $9.99.